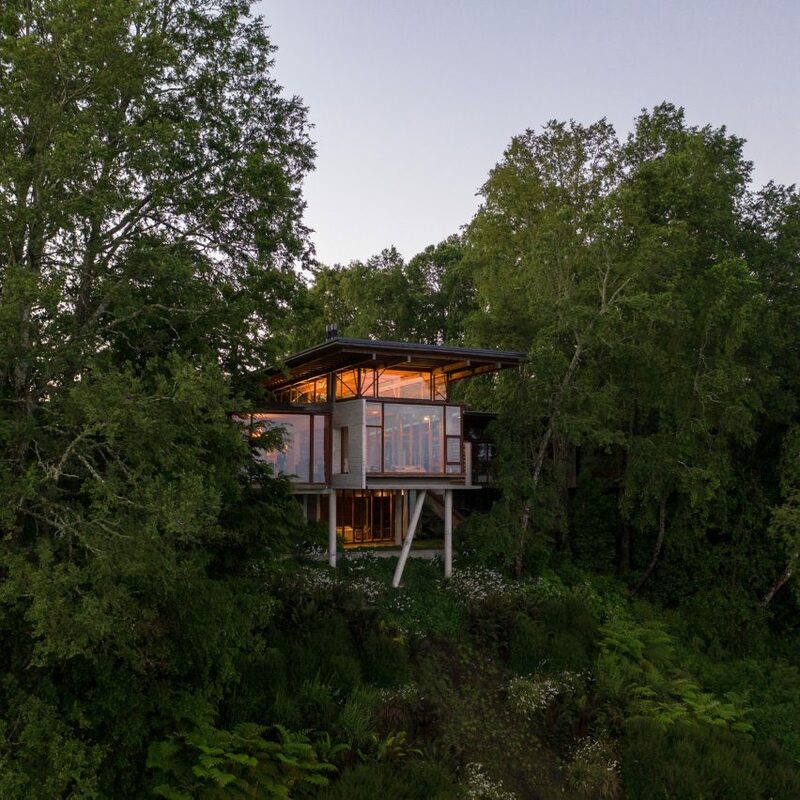 Santiago-based studio Aguilo + Pedraza Arquitectos has elevated this glass, concrete and wooden house above its Chilean landscape setting to offer views of oak trees, a lake and five volcanoes. Aguilo + Pedraza Arquitectos designed the family house to top a stepped plot in Los Lagos ? a mountainous region in southern Chile. Rather than excavate into the site, the studio chose to raise the residence above the slope to offer elevated views of its surrounds. "In this context, the structure is located on the second of these terraces, a location that delineates three major views: a nearby forest of new oak trees, the lake in the distance and a backdrop of five volcanoes emerging from the Andes Montains," said Aguilo + Pedraza Arquitectos in a project description. Lifted on concrete stilts, Apus House comprises a series of glazed volumes slotted between exposed concrete walls ? portions of which are covered with wooden logs, as a reference to the forested surroundings. "Walls and slabs were built with exposed concrete, a material with appropriate structural rigidity to enable the volumes to be suspended using merely a few pillars, thus creating an attractive visual game," said the studio founded by Diego Aguilo and Rodrigo Pedraza. Aguilo + Pedraza Arquitectos arranged the house as four volumes connected by a glazed, stilted passageway measuring 80 metres long.